I was having friends over and I wanted to make something quick and already assembled…meaning not a cheese platter for us to munch on while we talk, and it would have to go great with a bottle of wine. I had a jar of fig jam from the farmer’s market and walnuts in the pantry. I always have cheese in the fridge. I put them together and took a bite, it was good but missing something. I drizzled some organic honey over it and took another bite… it was great. Slice the baguette into 1 cm slices. Place on a lined baking sheet and drizzle with olive oil. Bake for 10 minutes. Meanwhile, place a frying pan on medium heat. Toast the walnuts for about 5-8 minutes stirring occasionally until the are warmed through and you can smell them. Remove from pan and put into a bowl. Add the jam and stir until they are fully incorporated. 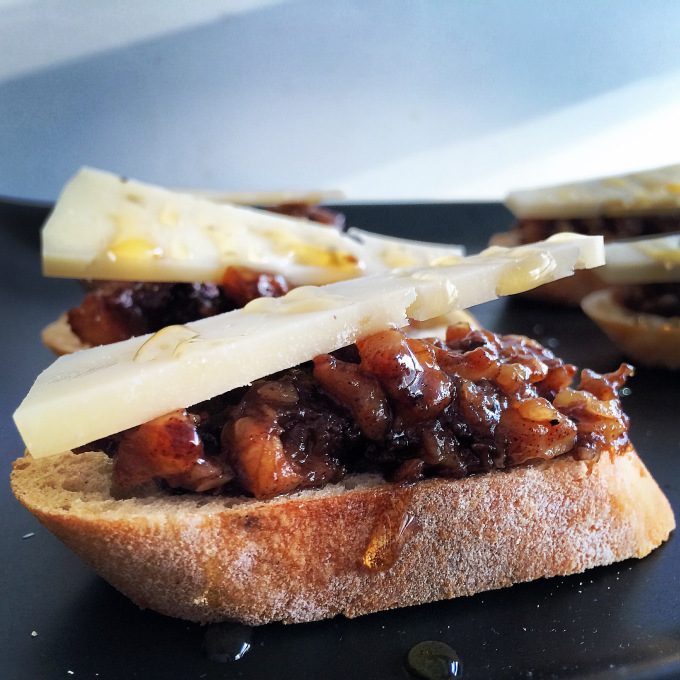 Spoon the fig walnut mixture onto the baguette, top with a slice of cheese and drizzle with honey. This is a real crowd pleaser and so incredibly easy to make. You can use any hard cheese, but if you can get this one, it works really well. I first had it about a year ago and loved the flavour. It’s nutty and sharp and works really well with dried fruit. Ok, I need to try this!